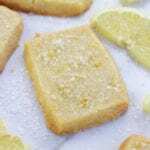 Lemon Shortbread Cookies Recipe creates the most amazing melt in your mouth buttery sweet cookie with a luscious lemon flavor. These cookies are perfect for everything from Holidays to special occasions or just simply as a treat for lemon lovers. Using a stand mixer with paddle attachment mix together softened butter with zest of 2 lemons making sure to scrape down sides halfway through mixing. Mix granulated sugar with butter just until combined and then mix in lemon extract. Sift together flour and salt. With stand mixer turned off, add all of the flour mixture and mix on the lowest speed until dough just comes together, about 2 mins. Place dough on lightly floured surface and form into a disk. Wrap in plastic wrap and chill for 30 mins. Zest 3rd lemon and mix with sparkling sugar. Roll chilled dough into 1/2 inch thickness and form into a rectangle as best as possible. Using a sharp knife cut cookies into 1 inch by 3 inch rectangles. Using a spatula place cookies on 2 ungreased cookie sheets. Evenly sprinkle each cookie with sparkling sugar mixture. Bake for 20-25 mins or until corners turn a light golden brown, making sure to turn cookie trays halfway through baking. Let cookies cool on cookie sheets. **Inspired by Ina Garten original shortbread recipe.